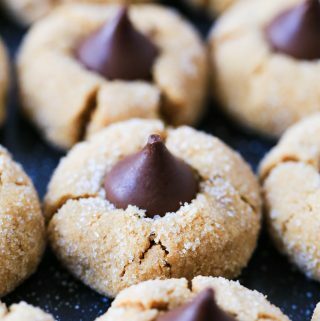 These peanut butter blossom cookies are the perfect addition to your gluten-free holiday cookie platter. Use a 1-to-1 flour blend to mimic the real thing! Remove wrappers from 24 Hershey’s Kisses and set aside. Line two baking sheets with parchment paper. Beat shortening and peanut butter in large bowl until combined. Add granulated sugar and brown sugar; beat until fluffy. I’ve found that it starts to coat the sides of the bowl when it’s ready. In a separate bowl, stir together the flour, baking soda and salt. Slowly add this dry mixture to the peanut butter mixture. Shape dough into 1-inch balls. Roll in granulated sugar and place on cookie sheet. Press down lightly with your hand. I find that the gluten-free ones crack more easily when putting on the Hershey’s Kiss after they’re cooked, so I try to help out the process a little bit when the dough is still raw. Bake at 350 degrees for 8-10 minutes until lightly browned. Remove from oven and immediately press a chocolate kiss into the center of each cookie. The cookie will crack around the edge. Remove from cookie sheet to a wire rack to cool. These freeze really well!